I got this recipe from Simple Recipes & it was yummy! Below is my adaptation. It is pretty much the same as the original recipe, except i added the garlic & cheese. I also used ground turkey instead of ground beef, because we were having Brad's family over for dinner & his sister is allergic to beef! It turned out really good. 2. In a skillet, brown the ground turkey, onion & garlic. Add the red pepper, celery seed, canned tomatoes & worcestershire sauce. Bring to a simmer & let simmer for 5 minutes. 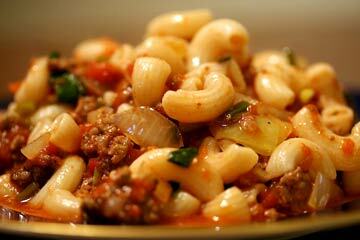 Mix in the drained & cooked macaroni & parsley. Simmer for another 5 minutes. 3. Serve with a crusty bread & salad. Oh my I love comfort food. I'm having a minor freakout because comfort food is not the same up north. This looks really good and it doesn't sound that difficult so I'm going to give it a try.